Karl Korab was born in 1937 in Falkenstein (Lower Austria) in the wine district, the son of a forester. As a child he experienced the horrors of World War II, which influence his artwork today. He studied from 1957 to 1962 at the Vienna Academy of Fine Arts at Sergius Pauser. In 1959 he moved within the then highly influential Vienna School of Fantastic Realism. Korab is a versatile artist and starting from Surrealism he evolved a simplified, enigmatic imagery. 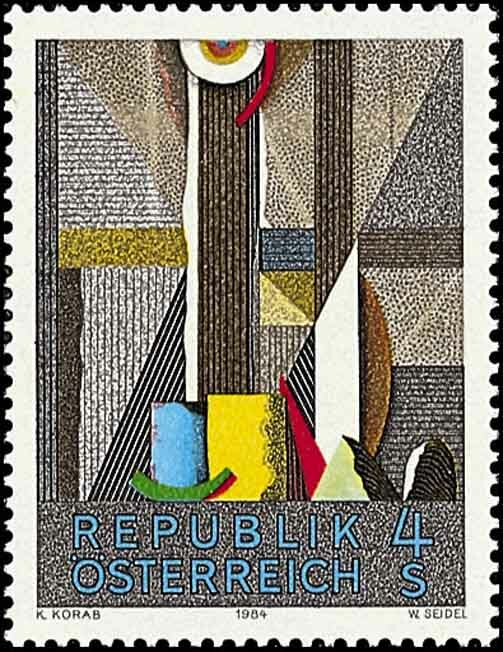 His works include oil paintings, graphics, collages, screen printing and lithography, mainly still lifes, mask-like heads and landscapes, but also postage stamps, bottle labels and book illustrations. His works stand out for their simple forms and contents. He also works as a stage designer. 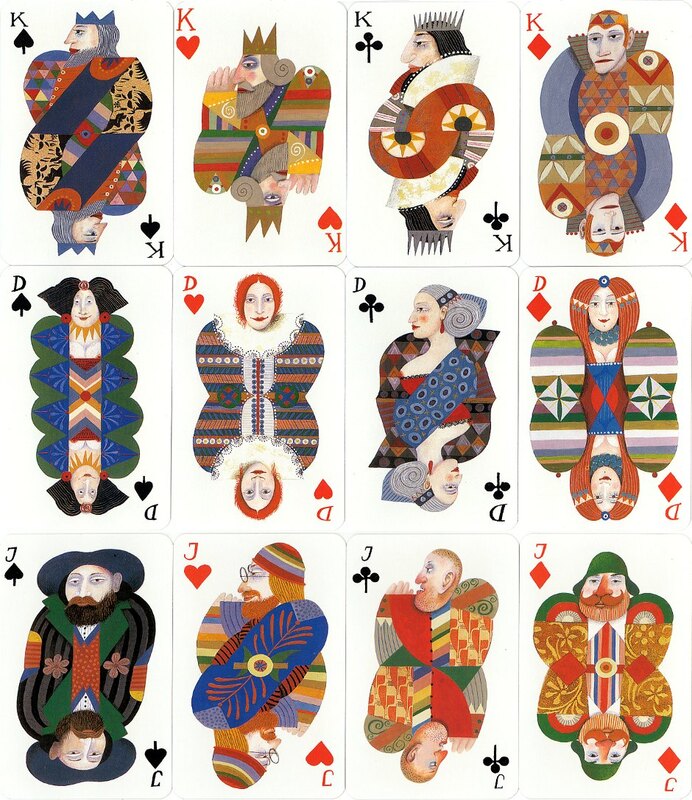 This is the second of two decks of playing cards designed by Karl Korab. The first, published by Molden Edition Graphische Kunst in 1973, can be seen here. 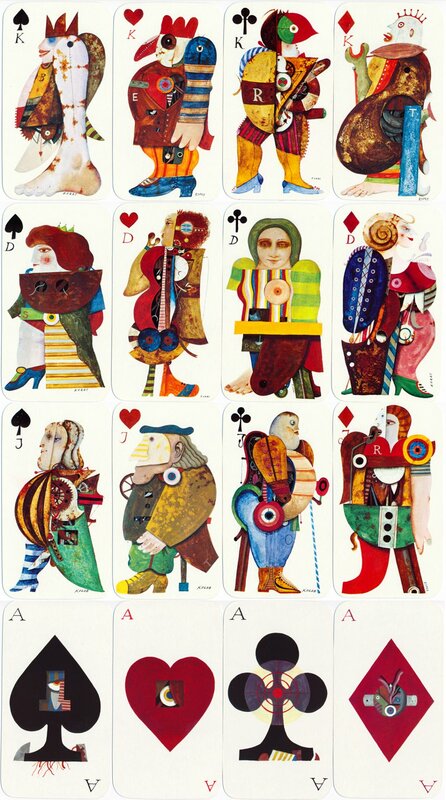 Above: non-standard playing cards designed by Austrian visual artist Karl Korab (b.1937-), printed by Piatnik, Vienna and published by Edition Hilger, 1991. 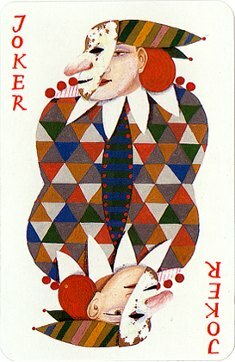 52 cards + 3 Jokers; 58x88mms. Images courtesy Barney Townshend.